9x9 Crafting table: The "Workbench"! The Workbench is a unique crafting table which offers a grid of 9x9. This does not mean however that there will be recipes larger than 3x3... But rather, any and all recipes that you create in it will be shown as a possible output, like so. As the correct combinations for all of these recipes exist within the 9x9 grid, they show up as an output, and clicking on them consumes the materials like normal (which can cause other recipes to cease to exist in the grid). It scans from top left to bottom right, and if there are more than 36 recipes, or duplicates of the same recipe, the one closest to the top left is prioritized. The Workbench can be crafted like this. The logs can be replaced with any type. The paper, axe, and pickaxe can be placed in any order, but the tools must have full durability. I can't texture nor render a block sprite, so there's a placeholder instead, as shown. Please give me any constructive feedback you have, it is greatly appreciated! This would be a nightmare to code. Think something along the lines of trying to predict possible moves on a chessboard (granted, there are fewer squares, but MANY more piece combinations). No support. Correct me if I'm wrong, but this may be way too hard to put into the game without causing issues. If it isn't (which it probably is possible) then I fully support this. It would definitely come in handy. 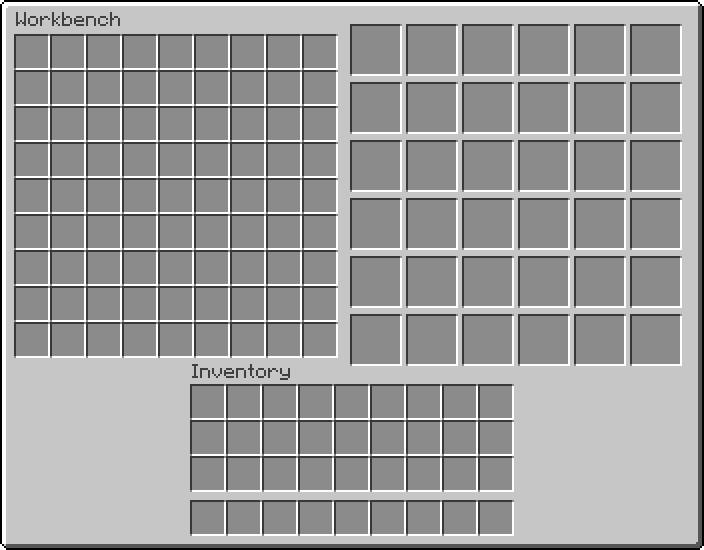 How would the 9x9 crafting grid fit alongside or above the 4x9 player inventory, and would that GUI end up exceeding a reasonable minimum screen resolution for the game? Edit: I guess the GUI could look similar to the gold chest GUI from the Iron Chests Mod (made to work more like a crafting GUI), although that still seems pretty big for a standard GUI box in the game. It will then let you craft a pickaxe, a shovel, a hoe, and an axe, all without having to rearrange anything! You can already do this though? No, the placement in the picture won't produce anything in the normal crafting table. You could do a hoe and a pick together or an axe and a hoe. The only real timesaver now is with armor, you can do helmet, breastplate and boots together but you still have to count the right number of diamonds for the chestplate and helmet so that the diamonds that don't fit the next recipe run out before you can craft it. I guess you can do wooden stairs, slabs and pressure plates together, but how often would you want to do that. The biggest problem comes from rendering a 9x9 grid: everything would have to be tiny to fit it. Other than that, I don't see a problem with it, though it seems a bit difficult to use, but I suppose I'd get used to it. Also, it wouldn't take that long scan through the ~200 recipes that exist in the game, and it would take even less if optimized. I don't really see much point in this, maybe if you could leave the materials on the crafting table until you needed them again. I'd rather have an automatic crafting table with a built in chest for materials and built in recipes so you don't have to place anything. I quess that's how the Pocket Edition MATTIS crafting system works. See...on console we have a quick craft menu. Just click on something and boom, no recipes needed. We have the PC crafting system as well...but that thing is a nightmare for me. Maybe they could just add the consoles craft system or at least a varient of it. This to me...all do respect seems like a waste of time. I would much rather the item GUI to select the item you want to craft like in modded. I don't think there would be any use for this currently as it is too simple. How do you decide which diamond to "'ignore" and which to "use" ? Given the shape you did, why would it favor a pickaxe over an axe, for example? You might say "oh it will output both!" sure but that is only because you provided enough diamonds for everything. Say you put only ONE diamond in each spot. So you can get EITHEr a axe OR pickaxe OR hoe OR shovel. How would it decide exactly what to craft ? This would be end up being a complicated mess of arbitrary rules. Say you put only ONE diamond in each spot. So you can get EITHEr a axe OR pickaxe OR hoe OR shovel. How would it decide exactly what to craft ? From what what he says above there would be a selecter. It will show you all possible combinations with what you have there. If there is extra stuff left over it would ignore those. I made a quick (who am I kidding this took like an hour to make) mock-up of how the GUI would look. It checks all 49 unique 3x3 chunks in the 9x9 grid over the course of 49 ticks (so it can take two and a half second before the crafting result appears. You could probably optimize it way better than just spreading it out like that, I'm not good at algorithms or anything though, haha.). If one of those 3x3 chunks has a recipe, the output is then added to one of the 36 output slots on the right, which you can then click on to craft like normally. If there are more than 36 recipes (or the same recipe is repeated twice), the recipe closest to the left, or otherwise closest to the top, takes priority. I'm a bit spent after making the GUI, so I'll update the OP tommorow (?) with the mock-up as well as an example of it in use. Until then, please mind that I'm not a graphic designer, this is a mock-up for demonstration purposes only, please don't expect me to make it look anywhere as good as it could be, that's honestly a situation where I'd say Mojang would do a better job than me. Sorry for not addressing any criticism in this post by the way, I'll try and do that at a better point in time, doing it while tired wouldn't do any good. Whoo 600th post...! Instead of the huge grid just use a 3x3 grid. It can then have an area on the right to show ceaftable items with an arrow to scroll through them. 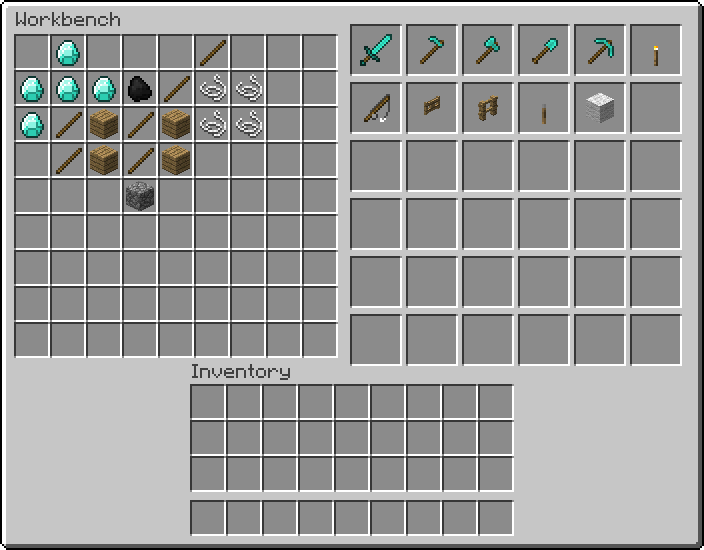 This will make the GUI a lot smaller and should make the search faster as it will only search through 9 blocks to look for any matches. Making the grid slightly bigger than 3X3, maybe 4X4 or 5X5 would allow for more combinations. In the example in the OP one could add a diamond on top and get a sword as well as the tools. What's wrong with just installing a mod? Or looking up the recipe for something? Clearly you want to create this for beginners. However, Minecraft is all about the guessing of recipes or just looking up recipes. The fact that the workbench already has a complicated recipe, the workbench's functions are overshadowed by the complexity of the recipe and would just be weird to use in game. Imagine 81 blocks in your face. It's as big as a double chest. Another thing I noticed, it kinda looks like the MCPE crafting table where you can get the available items you can create with your inventory items. Nothing special there. What's wrong with just installing a mod? Or looking up the recipe for something? Clearly you want to create this for beginners. Actually, this is aimed at players that aren't just starting out, as it allows you to multi-task and craft several things at once.. It doesn't show up recipes unless they're shaped correctly, so you'd have to know the recipe to put it in. Imagine 81 blocks in your face. It's as big as a double chest. As now demonstrated in the OP visually, it does not add recipes unless the correct shape can be found in the grid. This means that in order to craft a diamond sword, there must be a stick with two diamonds on top of it somewhere in the 9x9 grid, just throwing a stick and two diamonds in random locations gives you absolutely nothing. I updated the OP with a quick demonstration of how it would look and work like. Sorry for not responding to earlier comments, but I feel a lot of questions and/or criticism is addressed by the example in the OP. Sorry if it didn't address anything you said. Idk, maybe I didn't read it right or something..., because I obviously missed something here.